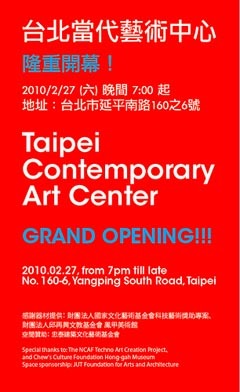 Originating from the principles of an art manifesto, a new contemporary art center in Taipei, the capital of Taiwan, is about to be launched through the initiatives of eight enthusiasts. For this inaugural exhibition Taipei Contemporary Art Center, which is scheduled to open at the same time as 3331 Arts Chiyoda, will present its very own Tokyo branch office. Jun-Jieh Wang is one of the members of this project and his unique career and achievements as both artist and curator have already gained acknowledgement in Japan.